The second moment is more chronologically precise, 16 October 2017, when Iraqi troops captured Kirkuk following the failed referendum of 25 September. This moment cancelled out the first, resetting the relations between the two forces. Its significance is not in the act of cancelling out itself, as important as that is, but in why this happened. The capture of Kirkuk revealed a lot about Shi’ite-Kurdish fault-lines and the impossibility of pursuing any meaningful relation between the two based on the 2005 formula. Away from the apparent frustration with what was seen by mainstream Shi’ites as Kurdish increasing overreach since 2005, the deeper cause for the Shi’ite extreme “joy” over the Kirkuk capture was a visceral, total rejection of the 2005 ethno-sectarian deal and the desire to rewrite it, and, through it, the story of Iraq, in the context of what can be called a “Shi’ite nationalist awakening” that emerged in reaction to the fall of Mosul in June 2014. That fall was a traumatic, soul-searching event for the Shi’ites. The chaotic images of the Iraqi army fast collapsing, the Speicher massacre and ISIS’s rapid advance toward Baghdad have been seared in the Shi’ite imagination as indications of their failure in running the country and responsibility for fixing it. The Abadi government was born out of this realisation, acting to represent it. Since then, a different, mainly reformist, trajectory slowly emerged, prioritising the “salvaging” of Iraq from the ruins, beginning with defeating ISIS, passing through the protest movement, and ending with the insistence on pronouncing dead “the political process” itself, including redefining the relationship of the KRG (Kurdistan Regional Government) with the federal government. But this redefining was a long-term goal; pacifying “Sunniland,” and mainstreaming the failing state institutions were more urgent and less challenging than “bringing the KRG in line”. The referendum changed everything as it presented Baghdad with an unprecedented opportunity to do just that. One should not ignore how this nationalist Shi’ite spirit will bear on any Baghdad–Erbil negotiations. On the Kurdish side, the dynamic has witnessed tectonic changes because of the referendum. Since 2005 the Kurdish nationalist narrative of victimhood and future independence guided dealings with Baghdad. Kurdish involvement in the state’s federalist project was more concerned with extricating power and resources from Baghdad’s grip than building durable institutions, whether in Baghdad or the KRG. The Mosul fall played out much differently in the KRG than in Arab Iraq, seeing Kurdish gains in territory and resources through their “opportunistic” control of Kirkuk and the rest of the disputed areas, which appeared a huge step towards independence. Despite ISIS’s threat to the KRG, the Kurds felt hopeful about the prospects of independence. It was the zero-sum mindset: The failure of the Iraqi state implied the viability of an impending Kurdish state. The words of the former KRG president, Masoud Barzani, about creating realities on the ground that the world would later have to accept echoed this sense of hopefulness. The aftermath of the referendum dramatically changed all of that. The Kurdish loss of Kirkuk on 16 October was the Kurdish equivalent of the Shi’ite 9 June, the day Mosul fell to ISIS. The catastrophic consequences painfully forced a Kurdish sense of pragmatism, similar to the newly-found Shi’ite impetus toward salvaging the state after the Mosul debacle. Statehood ambitions gave way to the more mundane challenges of daily governance and economic security, now to be tackled by a largely de-legitimised political elite. This pushed the Kurds towards Baghdad, instituting a conciliatory posture, away from the challenging, accusatory stance that dominated since 2005. Based on announced positions, leaks, and insider sources, there are broad makings of a Baghdad–Erbil deal: Joint control, with federal supremacy, over revenue-generating and “sovereignty” assets, including customs, border-crossings, the two airports in Sulaimani and Erbil, and oil in the disputed territories; a joint administration of the disputed territories, including Kirkuk; KRG’s acceptance of some Baghdad oversight over spending federal money; and Baghdad paying KRG’s public servants and the Peshmerga. This scenario looks much closer to Baghdad’s view of how relations between the two should function: hierarchical and integrative. This is also in line with the reformist spirit of the rising Iraqi Shi’ite nationalism. Such a deal would please Abadi’s Shi’ite base, earning him even more support. A demoralised KRG, devoid of international and regional backing and facing a worsening economic crisis and mounting public anger, can’t realistically reject such a deal as long as the federal structure of the relationship with Baghdad is maintained, and the fate of Kirkuk is left open-ended. Baghdad would make a colossal error if it decided to deal with KRG as a defeated party to be punished, instead of a weakened partner that needs to be helped and reassured. The challenge is not in the content of the deal so much as in who will negotiate it and when. With Western and regional powers on its side, Baghdad, in control of oil-rich Kirkuk and other disputed territories, euphoric with its recent defeat of ISIS, is in no hurry to negotiate, let alone compromise. Even if, plied with the right international pressure, they agree to start negotiations quickly, there is no reliable partner on the other side of the table. The KRG is in hopeless disarray. 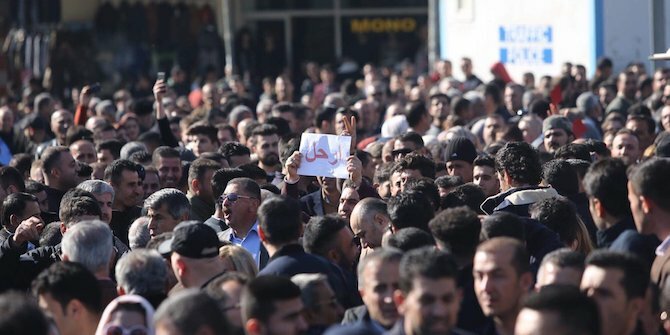 De-legitimised in the eyes of its own people, and consumed with internecine power struggles, the KRG lacks the necessary representative clout to negotiate. Its real authority covers only Erbil and Duhok, traditional KDP (Kurdistan Democratic Party) domains, while the PUK (Patriotic Union of Kurdistan) controls Sulaymaniyah. This would be tolerable if the two main parties could still speak with Baghdad with one voice. The PUK, greatly disorganised and weakened in its stronghold after the death of its founder, Jalal Talabani, and dismal governing failure, seeks unilateral deals with Baghdad. It is hampered even in this as a new political challenge to its authority has emerged through the rising Alliance for Democracy and Justice. Still worse for the KDP which dominates the Kurdish regional government, there is no unity even within the party about how to deal with Baghdad. The KRG’s Prime Minister, Nechirvan Barzani, eager to strike a deal, has been undermined by his own cousin, Masrour Barzani, in charge of the KDP’s security apparatus. Masrour’s father, Masoud Barzani, although officially retired, still pulls the party strings in favour of his son, further weakening his nephew, Nechrivan. The father and son, still holding hawkish views and unrepentant about the referendum debacle, function as the virtual spoilers. The situation is deadlocked in the KRG. There seems no other way out of this leadership crisis other than establishing a new political legitimacy in KRG that can represent the Kurds in negotiations with Baghdad. This means new elections that can produce legitimate leadership. But credible and transparent elections are difficult to organise without active regional and international monitoring. Otherwise, such customary election fraud practices – ballot stuffing, the dead turning up to vote – will happen again, bringing back the same failed, corruption-riddled parties to the helm. Baghdad, the US and the international community can play a decisive role in facilitating legitimacy-restoring by insisting on new elections, carefully monitored, and ensuring a peaceful and orderly rotation of power based on election results. Leaving the important business of elections to the management of the current ruling Kurdish class will result only in perpetuating the frustrating Kurdish status quo to the detriment of Baghdad, the KRG and the world at large.